This Lemon Greek Tortellini Salad with Chicken Sausage is incredibly easy to prepare and heartier than your typical pasta salad. Packed with Greek flavors, it’s perfect for a low-key summer dinner, but also makes a delicious dish to bring to a BBQ or summer party. This post is sponsored by al fresco All Natural Chicken Sausage, but as usual, all opinions are 100% my own. Thank you for supporting We are not Martha! Does anyone else lose all motivation to cook during these long hot summer days? Most evenings, when I’m done working, I just want to be outside enjoying the weather and getting out of the house I’ve been stuck in all day. But you know something wonderful about summer? Some nights my husband comes home and says, “want to grill tonight?” And I’m all YES. Because grilling is easy. And also, despite the fact that my husband doesn’t really cook at all, he loves grilling. So, I get a little break and still enjoy a delicious meal. Happy summer to me! 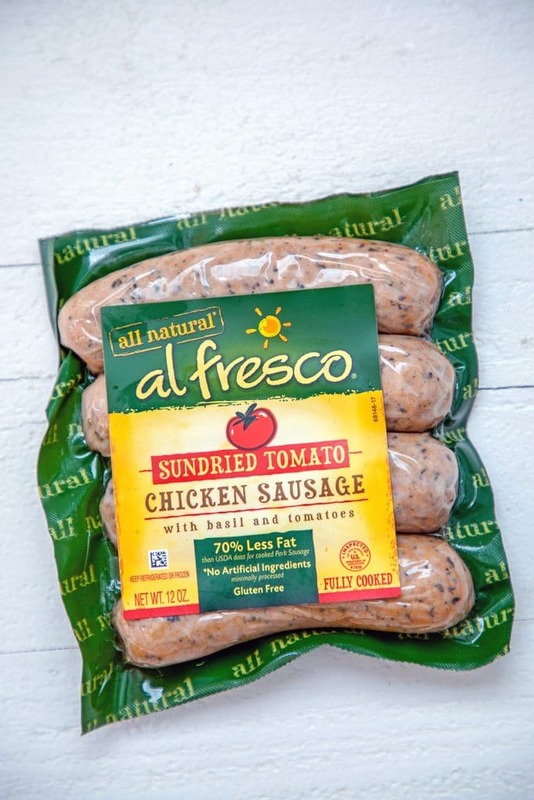 I’m thrilled to be working with al fresco All Natural Chicken Sausage on this post because it’s a product that I already always have in my fridge. And trust me, I eat a lot of it in the summer because when my husband’s at the grill, it’s generally what he’s grilling for me. 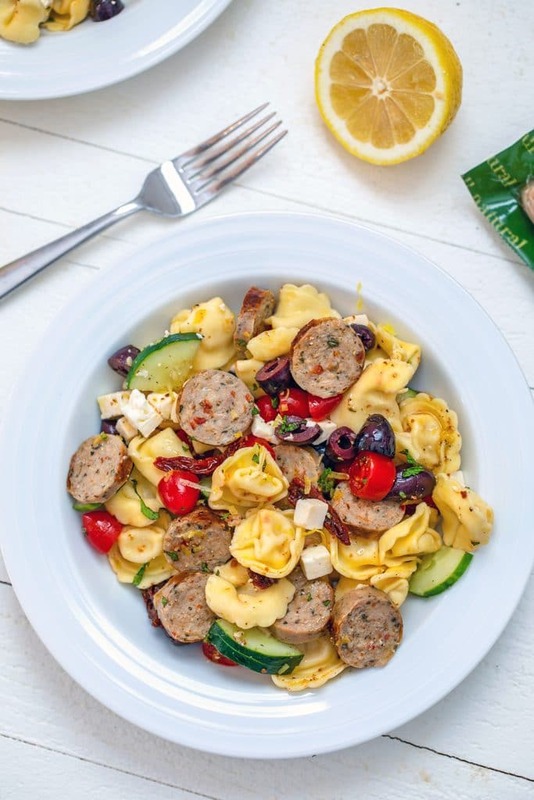 This recipe for Lemon Greek Tortellini Salad with Chicken Sausage will require a little bit of time in the kitchen, but it’s so incredibly easy and fast to prepare that you’ll still be able to get outside and enjoy these quickly fading summer evenings. Also? It will likely leave you with a ton of leftovers, so you can skip cooking for the next couple nights. Always think ahead, my friends! While we were eating this, Chris told me it was “the best salad he’s ever had.” Which made me realize, it’s a little bit sneaky to be calling it a salad. But pasta salads are totally acceptable, right? And this is basically a pasta salad that happens to involve chicken sausage, which makes it more of a meal than your typical pasta salad. I just had to laugh because of course his favorite salad would consist of pasta, sausage, and cheese! Can you blame him? 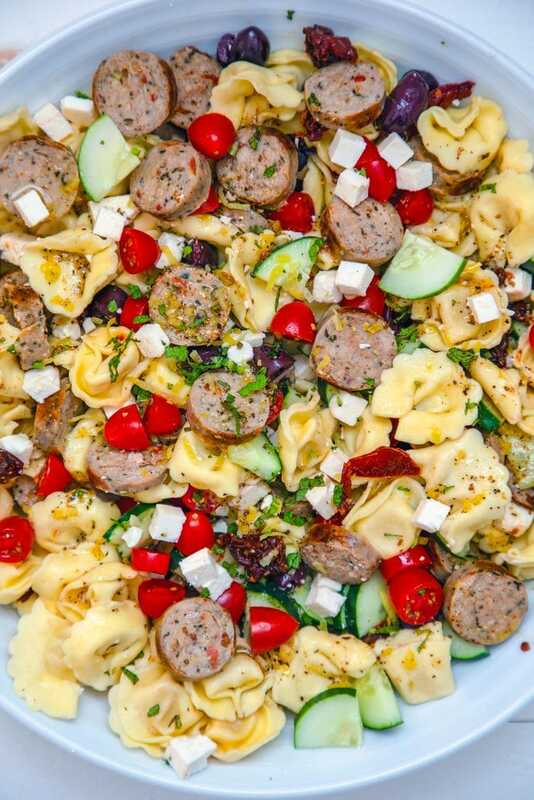 I built this tortellini salad around al fresco’s Sundried Tomato Chicken Sausage and decided to give it a bit of a Greek theme. A little bit of chopping and cooking your chicken sausage and pasta and dinner is on the table! Preferably your table that’s outside on a deck or patio, so you can enjoy the evening and a wonderful meal. You can either grill or sauté the chicken sausage; either way, they take less than 10 minutes to prepare (they’re already fully cooked, so you just have to heat and brown them). Of course, it started raining when I started cooking, so I sautéed mine. I also whisked together a super quick lemon dressing. And tossed everything together in a giant bowl. Dinner is served! And it was ready in just 25 minutes. You think 30 minute meals are where it’s at? I’m here for the 25 minute meals this summer. There are so many beautiful things about this dish, aside from all those pretty colors. First of all, it can be served cold, lukewarm, or even hot. I originally intended it to be served as a cold pasta salad, but I heated up the leftovers one night and it was delicious. Also, you can make a batch of this tortellini salad at the beginning of the week and have dinner and lunch in your fridge for days! 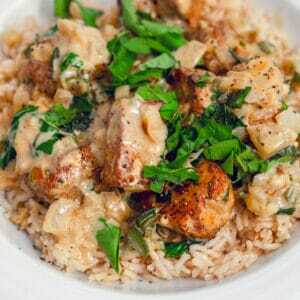 The chicken sausage makes it a heartier dish (while still keeping it on the healthier side) and an incredibly satisfying meal. But you can also bring this salad with you to a summer BBQ and it makes an excellent side dish. Plus, if there are any leftovers, the party hosts will be thrilled! Of course, if there are any ingredients you don’t like or any ingredients you want to see more of in this salad, go for it! I’m obsessed with all things Greek food, so I loved the feta, olive, and sundried tomato combo. The flavors all worked so well together and the lemon dressing and zest gave the dish an added zing. 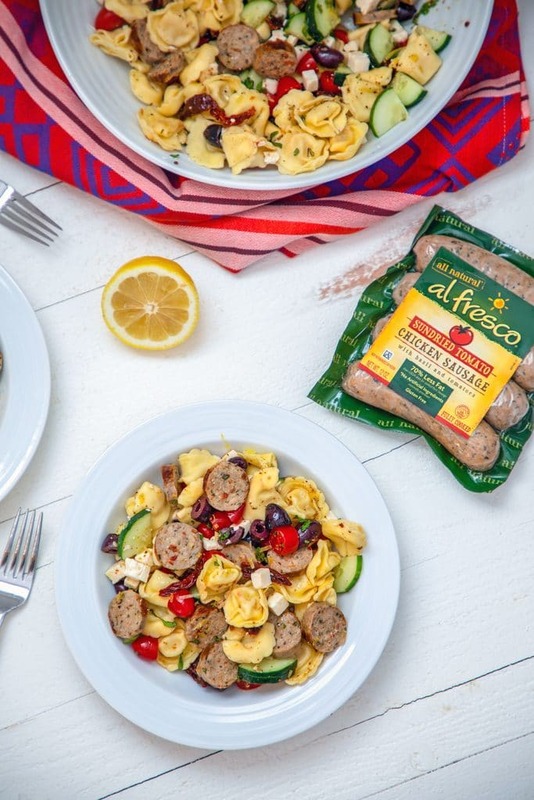 But I’m also kind of tempted to make curated tortellini salads with all of the al fresco chicken sausage varieties. That includes a buffalo chicken tortellini salad (al fresco’s Buffalo Style with Blue Cheese Chicken Sausage is my most purchased variety! ), a spicy jalapeño tortellini salad, and a BBQ tortellini salad. Would it be so bad if I just made this the summer of the tortellini salad and had one in my fridge at all times? That’s not even close to being a joke because I am now seriously craving a buffalo chicken sausage and blue cheese pasta salad. 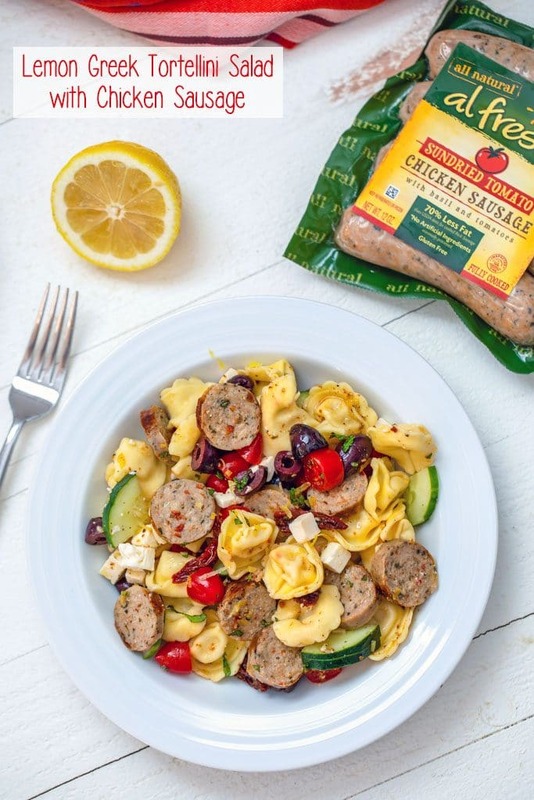 Which flavor chicken sausage would make your dream pasta salad? 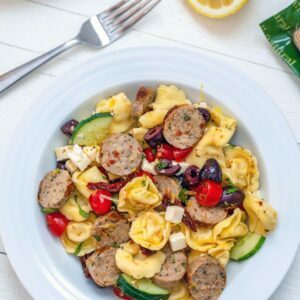 This Lemon Greek Tortellini Salad with Chicken Sausage is incredibly easy to prepare and much heartier than your typical pasta salad. Packed with Greek flavors, it's perfect for a low-key summer dinner, but also makes a delicious dish to bring to a BBQ or summer party. Bring a large pot of salted water to a boil and add tortellini. Cook according to package directions, drain, rinse with cold water, and place in a large serving bowl. While pasta is cooking, heat olive oil in a large sauté pan to medium heat and add chicken sausages. Cook 7-9 minutes, rotating frequently, until golden brown on all sides. Internal temperature should be 165 degrees. Remove sausages to plate. Once cool to the touch, place on cutting board and slice. Add diced cucumber, halved grape tomatoes, halved kalamata olives, cubed feta cheese, sundried tomatoes, and mint to the bowl with the tortellini. Add sliced chicken sausage. Drizzle the dressing over the ingredients and toss. Add salt and pepper and top with lemon zest. 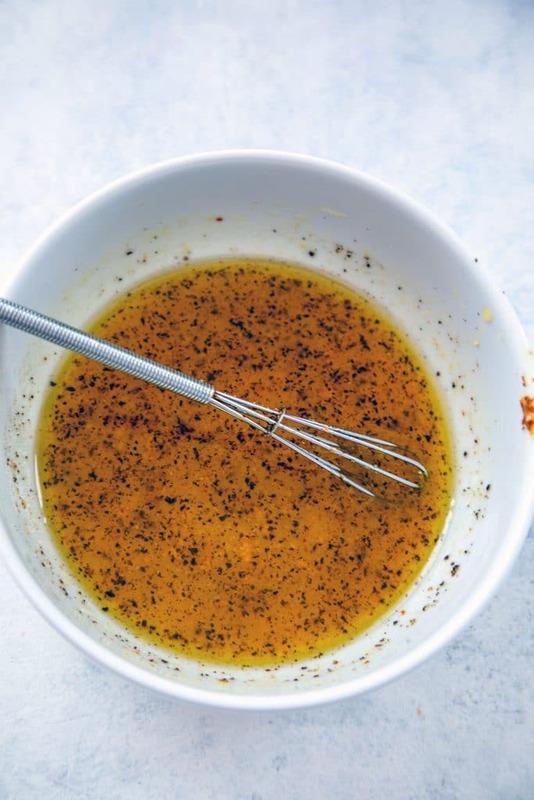 In a bowl, whisk together lemon juice, mustard, and honey. Slowly drizzle in olive oil, while continuing to whisk. Season with salt and pepper. If you prefer, you can grill your chicken sausage instead of sautéing them. Grill over medium-low heat for about 7-9 minutes until golden brown all over. 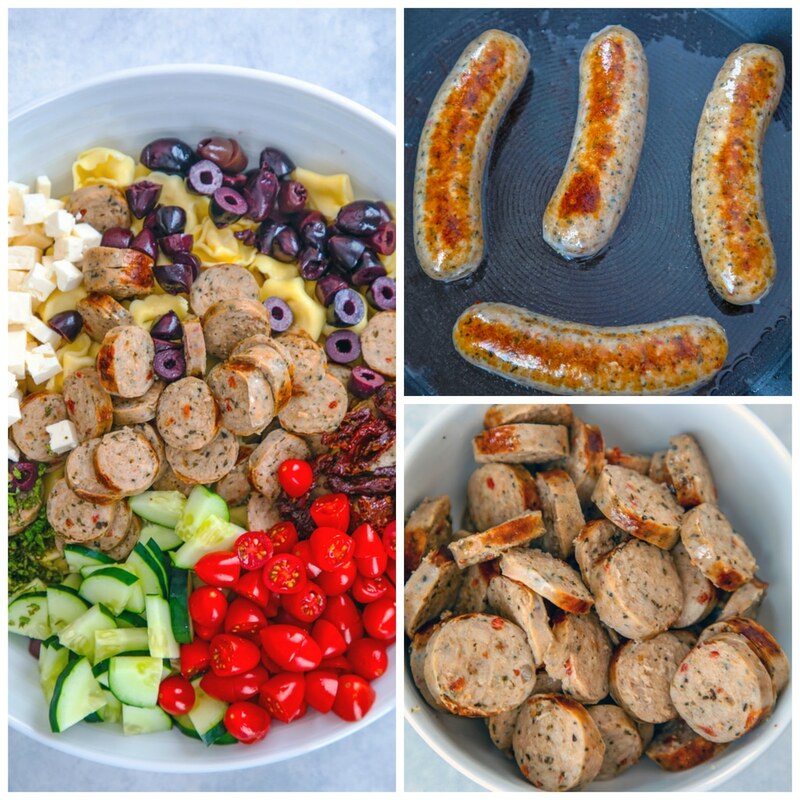 7 Responses to "Lemon Greek Tortellini Salad with Chicken Sausage"
Hooray for make-ahead! I’m really loving this tortellini salad and all the colorful mix-ins! It’s so versatile too! Love all the Greek flavours!! And the best way to enjoy salad as meal has to be with a pasta salad! Mmmm…Wish I had this for lunch today! 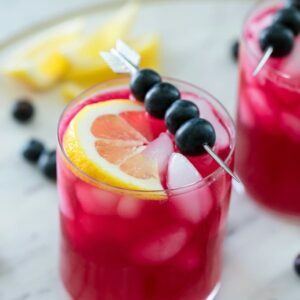 I too been trying spending less time in the kitchen so looking for easy recipes like this! Totally lacking in dinner motivation around here during the summer! 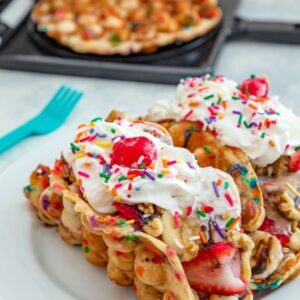 Love easy meals like this and i know my family would love it! LOVE al fresco sausage! Such a great idea to add it to a salad like that. Can’t wait to try! Love easy one bowl dinners and this looks perfect with all the textures & flavors. I’ve kinda been into the Greek flavors lately as well…so Good! 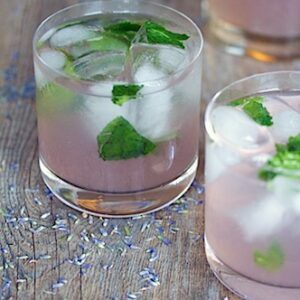 What a perfect easy weeknight meal!